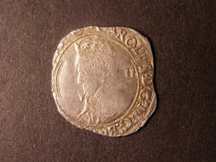 754 Shilling Charles I Sixth bust with stellate lace collar, mint mark triangle, 1639-40. S.2799. Very fine and full flan..
111 Charles I Shilling. Bust 4.4 with stellate lace collar, mint mark triangle in circle. 1641-3. Square shaped flan but excellent portrait. Good very fine/very fine. S.2799.